I wasn’t sure I was going to get any Christmas cheer spread to my dining room…but I added just a bit at the last minute. I have a heck of a time taking pics in this room…but hopefully that will soon change. I bought Shoot Fly Shoot on Cyber Monday for half price. I have high hopes of getting off the auto setting in 2013! For the table it’s all about layering. From the grain sack on the bottom to the balls in the bowl. I’ve had the wreath around the bowl for years. It matches the garland on my stairway. It moves around and lands in a different place every year. My tiny side table doesn’t hold much so I moved in this vintage drawer and stacked some plates. I like to come up with something different for the chandelier every year. 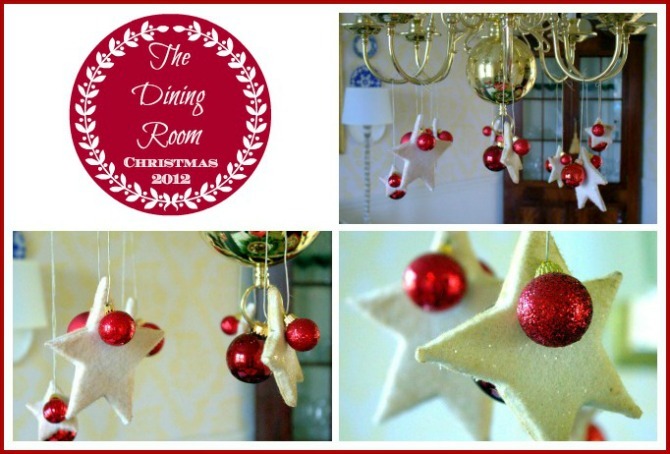 These little stars and red balls are simply hung with twine. I stole the stars from my tree and the balls were in one of those bottom-less bins I’ve talked about in previous posts. Good news about the bins though…they have now moved to the basement! 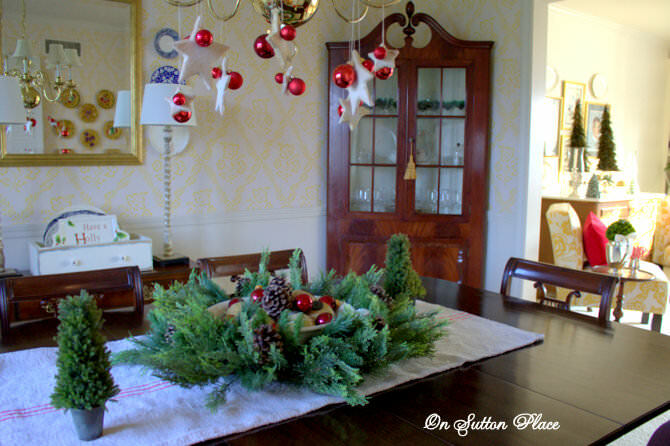 I love seeing your pretty dining room all dressed for Christmas, Ann. I love the centerpiece of greenery and bowl filled with goodies. 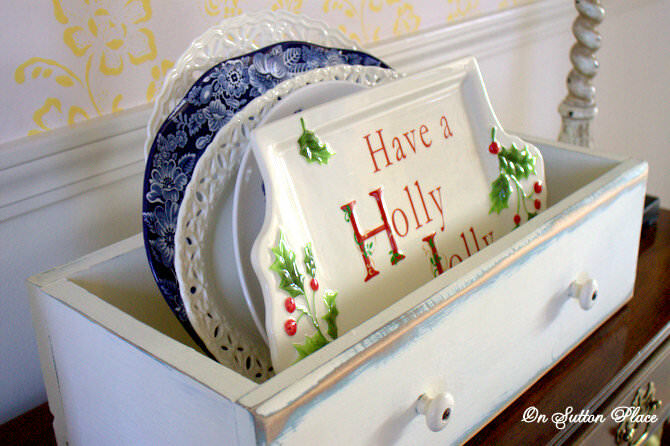 Love the vintage drawer filled with plates too! Merry Christmas to you and your family! Hi Ann! I hope to get off the auto settings in 2013 as well. Good luck to you! 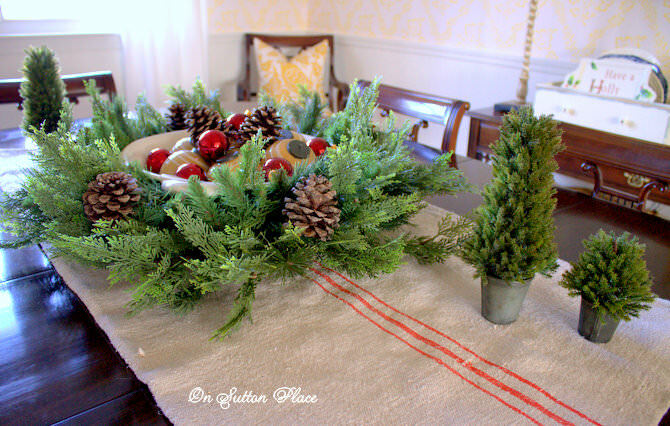 Ann…love, love your centerpiece..so perfect with the texture of he runner…..Beautiful!! I wish you and your family a very Merry Christmas !!! Your dining room looks beautiful, Ann! 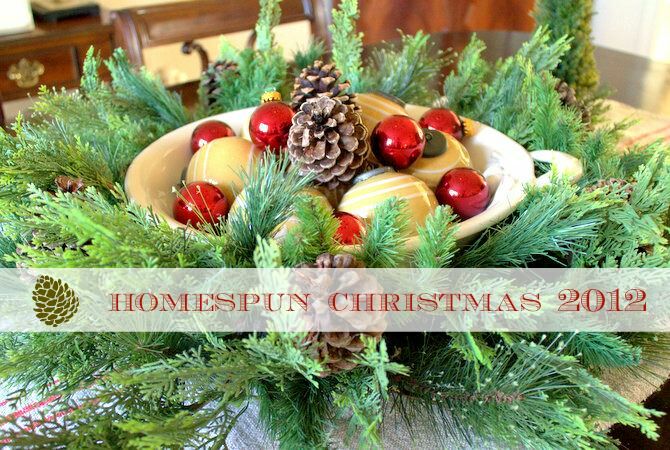 I love the bowl in the middle of the wreath. That wreath looks real! The ornies hanging from the chandelier is lovely. 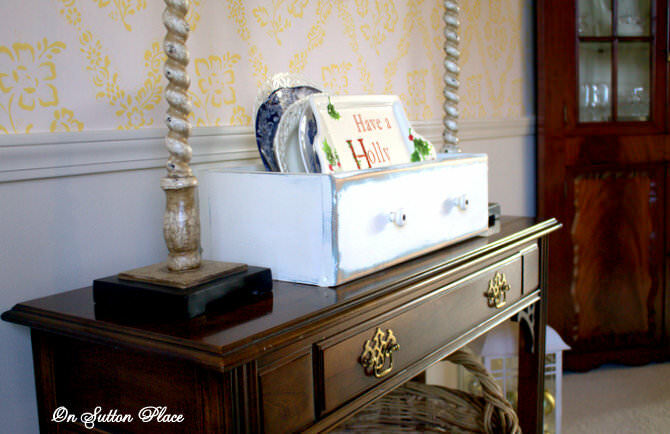 The old drawer is perfect on the sideboard. You have outdone yourself, dear lady. Merry Christmas and many blessings to you and yours in 2013. Everything looks pretty and all ready for the holiday! I like that box with the plates and tray in it! That prompted me to put together a small box for my Christmas cards! Your chandelier looks cute with the red balls and stars! I love seeing everybody’s ideas! I just wanted to drop by and wish you a Very Merry Christmas! Everything looks perfect! Merry Christmas to you and your family. Ann, that wreath around the bowl looks great. Wish I had one to put around a punch bowl, but I’ll just use some magnolia leaves this year. Love those darling stars and balls hanging from your chandelier, and that’s a great use of a drawer. We just had some high winds, and our tree on the porch was blown over. I’ll have to put it back together tomorrow. I hope you have a wonderful Christmas with your family! I think your dining room looks so pretty with the red accents and greenery. Love the grain sack table runner! I love star ornaments. In fact, I wish I had some somewhere. Yours are cute hanging from the chandelier. Ann it’s just lovely! Have a wonderful Christmas! Your dining room looks beautiful! All your Christmas touches are perfect! 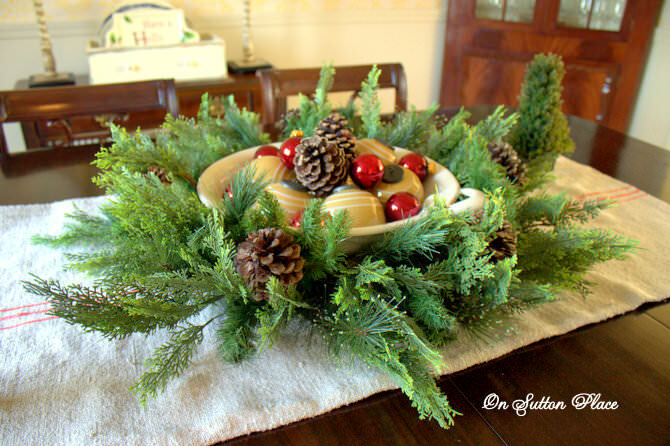 Love the wreath with the bowl on top of it. The chandy is pretty too. I was hoping to see the giant dough bowl but will wait on it. I have been off auto for a while and my images look blue. I did not study up. Have a lovely Christmas. Ann so cheerful and inviting. I am absolutely in love with your wallpaper in this room. Love, love, love it!! I told Kim great minds think alike this year, we all have balls hung with twine on our chandelier!!! It sure adds a lot for very little work doesn’t it? Merry Christmas Ann, love your colors!! I have always thought your photos looked good ann. i have heard of shoot fly shoot-hope you can benefit from it! Gorgeous dining room…love the wreath centerpiece and the vintage drawer with the plates in it. Unique and beautiful! Very festive i dded with all of your greenery. The vintage drawer is an eye catcher. Have a Merry Christmas. Your dining room looks divine, Ann. I think your centerpiece is so pretty, especially with the yellow balls mixed in. Lovely! Hi Ann, Thank you for your lovely blog! Merry Christmas! The wreath and little topiaries on the table are super cute. Love the white drawer with plates too. It looks beautiful Ann. I love the runner and your centrepiece. That wreath is gorgeous! Happy Holidays! That is lovely! Everything looks gorgeous! I love your centerpiece. Once you learn manual, you will be hooked. :-) I would LOVE to take that course. Your dining room is so lovely Ann! I live your bowl with the little balls in the wreath! Just so sweet. I wish you and your family a blessed Merry Christmas. Your centerpiece is fantastic. I just love it. Can’t wait to hear how you like your photo class. Your greenery is a fantastic touch Ann! Your home looks gorgeous. Merry Christmas to you and your family. Wonderful! The wreath is great; I thought it was fresh greenery. The stars and balls are fun. Your dining room looks wonderful Ann! I bought Shoot Fly Shoot when Kevin first came out with it and highly recommend it. Merry Christmas!